The sequel to a classic has got its up and downs. The only negative things I can say is, some acting is cheesy and you get a feeling of it throughout the show. Independence Day Resurgence tried to add the fun element of what the first had but didn't really achieve it. What I liked about Resurgence is that it reminded me of Star Wars/Star Trek in a way -- a futuristic setting and upgraded weapons. The Sci-fi element was heaped on a whole lot more than the first because the story is 20 years after the events of the first Independence Day. Now the world has used that alien technology to upgrade everything, especially their firepower. Some fear that the aliens will come back again to finish what they started, so preparing for a "resurgence" has been Earth's main goal. Will Smith is not in this sequel and the trailers mentioned killing him off on a training exercise. The hero of the first is killed off in a training exercise. How disappointing. He's survived by his son, Dylan Hiller (Jessie T. Usher). Because he's the son of a hero, he is thought of highly by everyone and has reached the top of the ladder in status. Dylan's not entitled and has worked very hard to be a top pilot in the world. He has a couple of friends and acquaintances who have been with him all along: Jake Morrison (Liam Hemsworth), Charlie Miller (Travis Tope), Rain Lao (Angel Yeung Wing) and daughter of the president from the first movie, Patricia Whitmore (Maika Monroe). Together with the help of old faces like David Levinson (Jeff Goldblum) and ex-president Whitmore (Bill Pullman) they will need everything to beat this new threat. 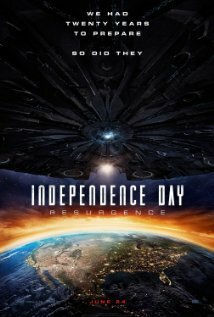 Unlike the first movie, the aliens are back but in a huge, gigantic mother ship and the queen of the aliens is pissed. It will take the whole world to fight an enemy this big. Independence Day Resurgence was a good sci-fi film and enjoyable. If you like such things, I'm sure you will like this one too but if you are looking for the same technological elements as the first you will leave disappointed. Things were left open for a sequel. There is action throughout, the story is okay and the acting is sometimes cheesy but if that's okay enough for you to go see, I suggest going.